The quarried and mined Collyweston and Stonefield Slates, used for roofing and walling, can be seen throughout the Cotswolds. They are sedimentary Jurassic rocks and the fissile quality required for splitting was induced by frost action. 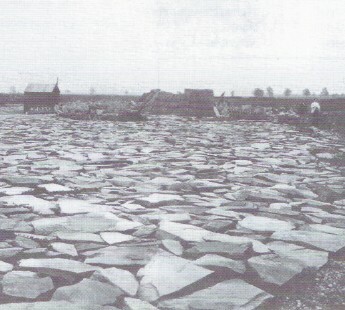 The blocks of 'slate' were layed down horizontally in fields (photograph above) over the Winter period.